The Iowa AmeriCorps 4-H Outreach Program is a unique partnership between AmeriCorps and Iowa State University Extension and Outreach. The vision of ISU Extension & Outreach 4-H is to prepare Iowa’s youth to be successful, contributing members of society. Caring Adults: Ongoing relationships with caring adults — parents, mentors, tutors or coaches — offer youth support, care and guidance. Safe Environments: Safe places with structured activities during nonschool hours provide both physical and emotional safety for youth. Mastery: To build knowledge, skills and attitudes and demonstrate the competent use of this knowledge and skill by a proficient practitioner. Service: To find yourself by losing yourself in service to others as a way to gain exposure to the larger community. Self Determination: to believe that you have an impact on life events rather than passively submitting to the will and whims of others. Youth must develop a sense of influence over their live, exercising their potential to become self-directing, autonomous adults. Planning for the Future: develop the ability to see oneself in the future enables youth to have hope and optimism to shape life choices, which facilitates the transition into participating in the future. Engaged Learning: An engaged youth is one who is mindful of the subject area, building relationships and connections in order to develop understanding. Through self-reflection, youth have the ability to self-correct and learn from experience. The engaged learner has a higher degree of self-motivation and an inexhaustible capacity for creativity. On December 13, 2004, then Governor Vilsack accepted recognition from America’s Promise designating Iowa as a State of Promise for children and youth. Consequently, starting in 2005, in collaboration with Iowa’s Promise, Iowa Commission on Volunteer Service, and the Iowa Collaborative for Youth Development (IOYD), Iowa State University Extension’s 4-H Youth Development program began hosting the Iowa AmeriCorps State of Promise program. 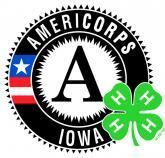 The program, now named Iowa AmeriCorps 4-H Outreach is administered by ISU Extension and Outreach, who coordinates the activities of the AmeriCorps members serving in communities across the state. The AmeriCorps members will lead efforts to recruit and mobilize volunteers for a variety of educational activities and programs, coordinate community youth leadership initiatives, develop new partnerships between private organizations and youth-serving programs, and design and develop community service learning projects. The AmeriCorps members are placed in various programs, organizations, and sites (government, faith-based, non-profits, and community-based) that focus on providing youth programming based on the 4-H youth development principles and practices. Emphasis is placed on the 4-H priority topics of 1) Healthy Living; 2) Science, Technology, Engineering and Mathematics (STEM): Citizenship and Leadership; 4) Communications and Arts. Providing youth leadership training to groups of youth who then take those skills to design and implement community service-learning projects. Enhancing out-of-school programs by developing enrichment programming to reach larger audiences. Educating youth on healthy lifestyle choices and creating youth recreational programs. Educating youth on work readiness skills and job skills. Developing or expanding youth philanthropy programs at volunteer centers and community foundations. Establishing alliances and partnerships with local government, faith based, and community-based organizations and initiatives. Helping local host-sites acquire the resources and volunteers needed to achieve long-term sustainability. Building local capacity by providing information on K-12 Outreach to local individuals, groups, and organizations. In exchange for their year of service, AmeriCorps members develop skills that build a strong, leadership-packed résumé, earn an annual living allowance and receive a post-service education award to finance higher education or pay towards qualified student loans. Additionally, AmeriCorps members may apply for education loan forbearance during their term of service. The Iowa AmeriCorps 4-H Outreach Program also provides basic health insurance for full time members and AmeriCorps offers a limited childcare subsidy for full time members who qualify financially. Full-time members serve at least 1,700 hours and half-time members serve at least 900 hours over a ten to twelve-month commitment at local host-sites. Quarter time members, serving 450 hours, and minimum time members, serving 300 hours, may be requested, but full and half time requests will receive preference.